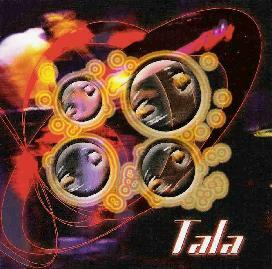 Tala are a three piece improvisational band from Canada and it is all about grooves. They write in the bio that they tour coast to coast almost constantly. They feature Steve on guitar-sitar, keys and vocals, Jason on electric and acoustic guitars and vocals, Adrian on drums and Darryl on bass. This is the bands debut CD and it is mostly instrumental funky jazzy rock music. The opening track is a pretty boring groove funk song. Cycles fades in from what was probably part of a longer jam piece and again is slowly funking away as the vocals are sung and remind me of PHISH. Indigo lies somewhere between funk and reggae and has some highly effected voices in the mid section. 7-11 begins very slowly and funks along and is pretty laid back. Weirder Than Me fades in as well and is a slow boring funky piece as well but becomes a bit like a ska song. 2:22 is a short experiment in sound. Nexus again is a laid back funky groove. They are good at this. Fat Gat features sitar and is the most interesting song on the CD for sure. Here Again ends the CD and is a very laid back number. I think they want to put you to sleep. These guys might be a pretty fun band to see live but I think most of this stuff is pretty boring as there is not much lead instrumentation and just a lot of funky rhythms on most of it and some singing. The bands web site exists but none of the links worked when I visited the site. For more information you can visit the Tala web site at: http://www.tala.ca.